I used the wheels/tires, cage, velocity stacks, and front half of the chassis for the custom. I wanted to go all out on the details but make the car very period looking and just down right extreme! I absolutely love the paint scheme that comes on the HW car so I left it alone and simply focused on highlighting the details. Painted the chassis black in the visual areas and painted the engine block chevy orange of course! My favorite thing is the white headers...period correct! Obviously you notice the mega tall velocity stacks by now! To add contrast, I painted the blower housing a dark grey to offset the stacks. The hardest part was the front section. The Maisto brand car has a more realistic looking front suspension so I grafted it onto the HW car. Painted it silver to look like leaf springs..
Reassembled and BAM!!! RAT GASSER! The red wheels with white walls look sooo perfect on this paint job. Stacks are taller than the roof...just how I wanted! Here you can see the detailed tail lights. Painted silver first for the chrome and then red for the lens. There you have it! 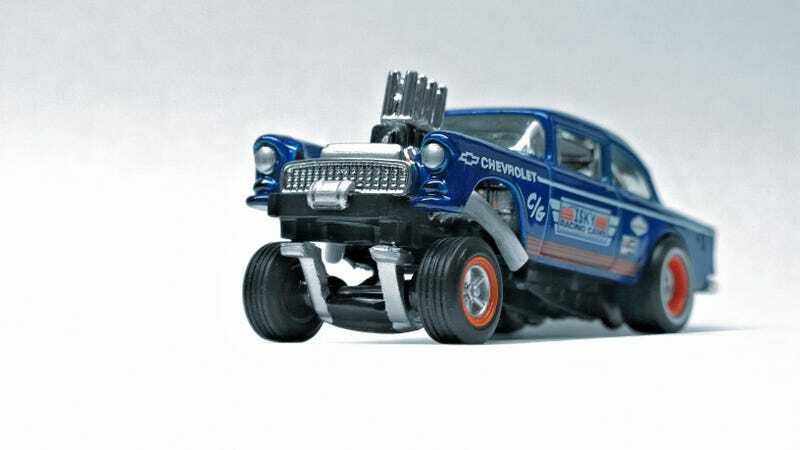 A gasser custom mix up between two cars. I hope you enjoyed! Weekend Hot wheels and Maisto haul plus cars from fellow Opponaut! PIC DUMP!!! !